This winter, I have had two exciting opportunities to explore how music can offer a platform for interreligious dialogue and intercultural understanding. In November, I travelled to Frankfurt am Main, Germany, to get to know the work of the Jewish-Christian-Muslim choir Interreligiöser Chor Frankfurt. This ambitious amateur choir works under the leadership of two visionary cantors – one Jewish and one Christian. Together, they aim at transforming not just the lives of the singers in the choir, but the surrounding society as well by showing how respectful dialogues can be built in music. The core of their repertoire is a project called Tehillim-Psalmen, which until now has resulted in ten concerts. For each concert, the cantors choose a Biblical Psalm around which the concert programme is built: approaching the text through compositions from various times and cultures representing diverse voices from Jewish, Christian and Muslim perspectives including both historical and newly composed pieces. The concerts are also accompanied by panel discussions, where theologians from the three traditions discuss the themes raised by the Psalm in question – similarities as well as differences. 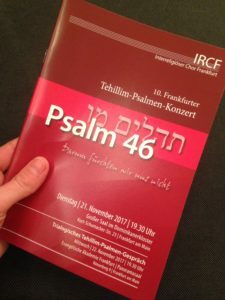 This time, I had the opportunity to take part in a concert dedicated to Psalm 46 and to interview the choir leaders, Cantor Bettina Strübel and Hazzan Daniel Kempin. I was very inspired by their visions for community building, their understanding of music as a space for dialogue, respect and understanding – between religions as well as between religions and the secular world – and the delicate balancing between sharing while not mixing traditions. For them, this means respecting the particularity of each tradition while still bringing them close together in a shared sonic space. 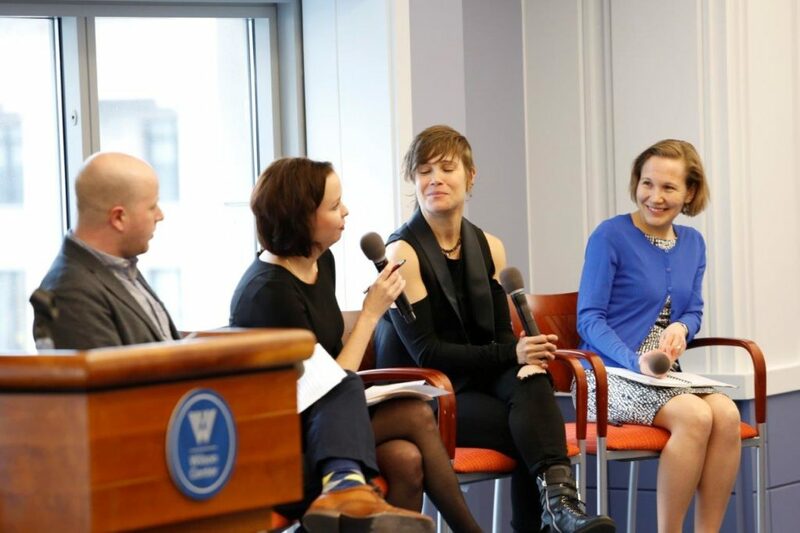 The second opportunity to explore musical dialogues presented itself in January as I travelled to Washington DC to discuss another important project, developed by my dear friend, former orchestra director and current visiting scholar at the Wilson Center, Emilie Gardberg. Together with the scholar of musicology Susanna Välimäki, we are currently working on a book entitled “Music for a Better World”. Based on a series of concerts and lectures arranged by the Philharmonic Orchestra of our hometown Turku in Finland in 2017, we explore music as a powerful context in which understanding between persons of different cultural and religious worldviews can be enhanced and a more just society envisioned. We believe that by actively listening to and reflecting on iconic pieces of classical music, which in different periods of time have had a transformational effect on society, music can contribute to shaping a better world in a concrete and accessible way. The presentation at the Wilson Center was met with great enthusiasm by the audience, which included scholars and musicians as well as educators and cultural workers, and we are strengthened in our conviction that music can play an important role in building peaceful, just, diverse and respectful communities in the future. These fascinating examples of music and interreligious dialogue will be explored in my lecture at Fuller Theological Seminary in November. Building on the theoretical framework I developed together with my colleague W. Alan Smith (see references below) I will look at the arts – especially music – as dialogue in themselves and of their own right. I will advance the argument that the arts should not be regarded as mere illustrations of theological claims and cognitive contents, often assumed to be the “real” substance of dialogue. Instead, they can create nuanced dialogical spaces of their own. Thus, I suggest a non-binary view of dialogue where intellectual and emotional, cognitive and embodied dimensions are integrated into a nuanced and comprehensive engagement across religions. 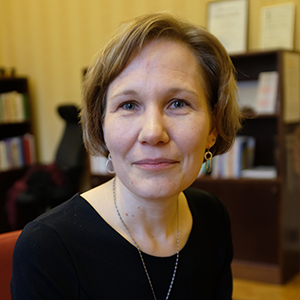 Ruth Illman is Director of the Donner Institute for Research in Religious and Cultural History and Associate Professor of Comparative Religion at Åbo Akademi University in Turku, Finland. She is one of the plenary speakers for Fuller’s School of Intercultural Studies’ Missiology Lectures.